Pope Francis I, who named himself after the nature-loving Saint from Assisi, spoke about the need to safeguard creation during an audience at the Vatican last week. Pope Francis went on to say humans should not view themselves as Masters of Creation. “Creation is not a property, which we can rule over at will; or, even less, is the property of only a few: Creation is a gift, it is a wonderful gift that God has given us, so that we care for it and we use it for the benefit of all, always with great respect and gratitude,” he said. “Safeguard Creation,” the Pope added, “Because if we destroy Creation, Creation will destroy us! Never forget this!” He went on to note that while God forgives, creation does not. The Pope’s championing of environmental issues echoes his predecessor, Pope Benedict XVI, who spoke often on climate change and other pressing environmental crises. Solar panels were installed on the Vatican during Benedict XVI’s reign. There are an estimated 1.2 billion Catholics worldwide; the Pope serves as the head of the Christian denomination. 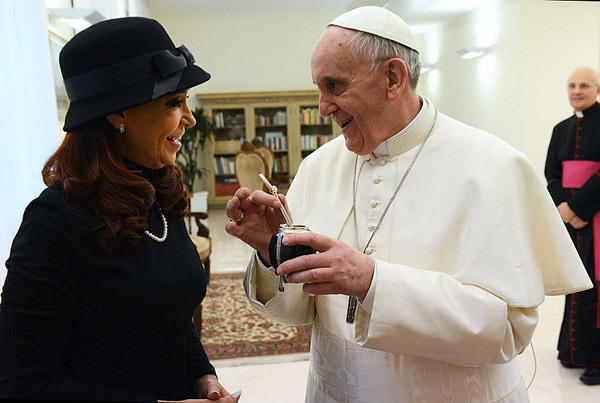 Pope Francis I meets with the president of Argentina, Cristina Fernandez de Kirchne. Photo by: Casa Rosada/Presidency of the Nation of Argentina/Creative Commons 2.0. (03/10/2014) Indonesia’s Islamic clerics drew praise from conservation groups last week after the top clerical body in the world’s largest Muslim-majority country issued a fatwa, or religious decree, against poaching and wildlife trafficking. The Indonesian Council of Ulema (MUI) announced the fatwa on Tuesday, declaring the illegal wildlife trade to be haram, or forbidden under Islamic law. The fatwa forbids Indonesia’s Muslims from “all activities resulting in wildlife extinction” and is meant in part to help support existing national laws protecting endangered species, which are poorly enforced and have done little to prevent poaching. (06/10/2013) Tibetan monks could be the key to safeguarding the snow leopard (Panthera uncia) from extinction, according to an innovative program by big cat NGO Panthera which is partnering with Buddhist monasteries deep in leopard territory. Listed as Endangered by the IUCN Red List, snow leopard populations have dropped by a fifth in the last 16 years or so. Large, beautiful, and almost never-seen, snow leopards are the apex predators of the high plateaus and mountains of central Asia, but their survival like so many big predators is in jeopardy. (03/28/2013) Many religious groups have taken on the role of environmental custodians, citing scriptures that urge living in harmony with plants and animals. 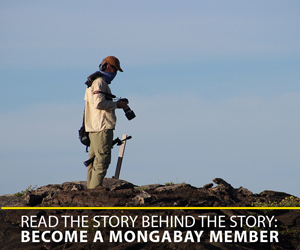 Representatives of nine world religions pledged in 2009 to develop environmental programs. The Sikh religion’s contribution to that effort is called EcoSikh. With a global community 30 million strong, Sikhism is the world’s fifth largest religion. Sikhs trace their roots to Punjab. In the 1960s and 1970s, the Green Revolution — research and technology breakthroughs that dramatically increased agricultural yields worldwide — turned Punjab into “the breadbasket of India.” In the past 20 years, though, the intensive farming has eroded Punjab’s soil and water. (03/20/2013) In his first homily as the new pope, Francis I spoke of the need to act as protectors both for the environment as well as for the poor and weak. With his focus on the environment the new pope echoes both his namesake, Saint Francis of Assisi, as well as the previous pope, Benedict XVI who championed environmental causes from climate change to biodiversity as crucial to the Catholic religion.